Decisions of international courts and arbitrators, as well as judgments of national courts, are fundamental elements of modern public international law. 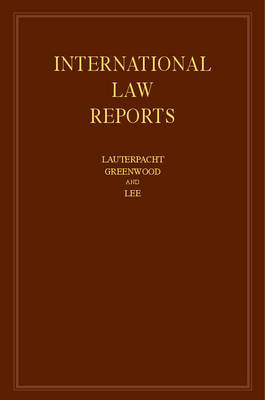 International Law Reports is the only publication in the world wholly devoted to the regular and systematic reporting in English of such decisions. It is therefore an absolutely essential work of reference. Volume 164 reports on, amongst others, the 2012 Advisory Opinion of the International Court of Justice in Judgment No 2867 of the Administrative Tribunal of the International Labour Organization upon a Complaint Filed against the International Fund for Agricultural Development, together with the related judgments of the ILO Administrative Tribunal, the 2015 judgment of the Federal Court of Australia in Ure v. Commonwealth of Australia and the 2013 United States Supreme Court decision in Kiobel v. Royal Dutch Petroleum Co.